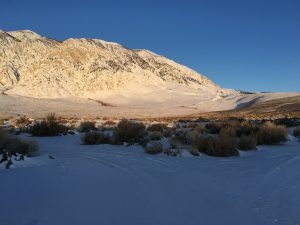 One incongruous bit of good fortune lately has been the snow cover lingering well down into the Owens Valley, kept alive by fresh showers and cold temperatures. This has made it possible for me to put on skis less than a mile from my winter abode. 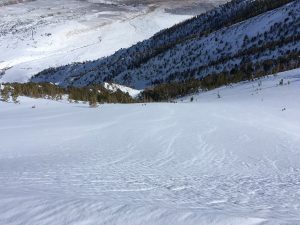 There is not a whole lot of skiable terrain nearby, but there are numerous chutes all along Wheeler Crest, a long ridge between Pine and Rock Creeks west of the Sherman Grade, where Highway 395 climbs from the Owens Valley to the higher plateau south of Mammoth Lakes. I had tried the Mayfield Couloir on the southern end, finding too little snow and too many exposed willows. However, the couloirs farther north, west of Swall Meadows, seemed to have better coverage. I first tried on a storm day, skinning up the powerline road southwest of Swall, then blindly following a couloir to around 8500′, where the cold and wind convinced me to turn back. I found some decent powder on the way down, but it was tricky skiing without being able to see surface features and obstacles. The route clearly had potential, though, so I returned the next day to try to finish it. The forecast predicted calm, sunny conditions, so I got a fairly early start around 7:00 AM despite its only being around 20 degrees out. Like the day before, I hiked around a mile from the house with skis and boots on my back, then switched as quickly as possible with rapidly-numbing fingers before skinning up the powerline road. Beyond the road closure, I found it much easier to pick a line to the couloir’s entrance now that I could actually see things more than a couple hundred yards away. 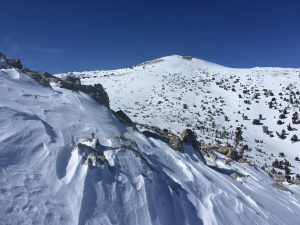 I eventually traversed north to the northeast ridge of Point 11,485′, where I found pleasantly wind-packed snow and easier travel. I neared the point around 1:00 PM, and was tempted to skip Wheeler Crest’s summit, which still looked far away. Telling myself that there was still plenty of daylight and I needed the exercise, I skinned on, finding much easier travel near the wind-scoured crest. The final 50′ to the summit was mostly bare rock, though the register (if any) was buried enough that I did not bother to look. 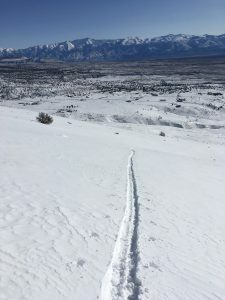 I took a few quick photos, checked out the views of upper Rock Creek to the west, Tom, Humphreys and the Palisades to the south, and the White Mountains across the way, then locked in my heels to ski back toward the chutes dropping from 11,485′. I tried to build up some speed going through the saddle, but still had to do some miserable slow-motion struggling to get back to the ridge. It might have been faster to put my skins back on, but I am very slow at transitions. While cornices had formed elsewhere on the ridge, there was just an initial steep slope on the chute I chose. The upper slopes were covered in wind-crust hard enough that I did not sink in. Unfortunately, the crust became less predictable lower down, and I managed to tip slowly and embarrassingly downhill several times when I unexpectedly broke through and lost my balance. Finally, just above the previous day’s highpoint, I found more consistent powder, and enjoyed some nice turns down to the desert brush. I picked up the powerline road, glided just past where I had put on my skis in the morning, then hiked back home. This entry was posted in California, Skiing. Bookmark the permalink. Where’s your winter abode? Somewhere in downtown Bishop? A bit north. Let me know if you want to come visit and ski. It has been a bit of a weird winter, but I’m enjoying it more now. I’ve got my summer planned, and it definitely includes work week. See you there!